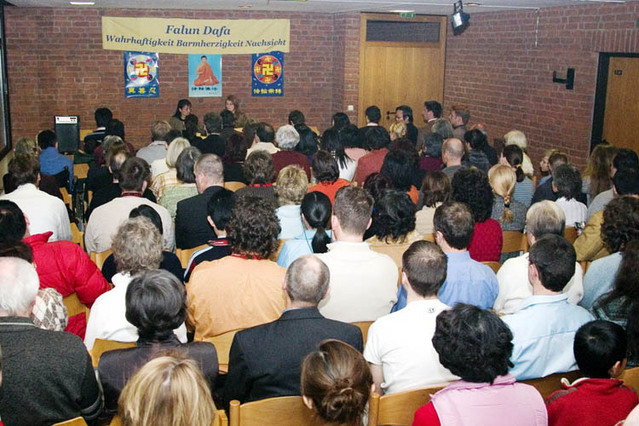 The 2006 German Falun Gong Experience Sharing Conference was held in the city of Wetzlar. Six Chinese and western practitioners shared their experiences. Subjects discussed including telling the people of the world about the persecution of Falun Gong in China, how to deal with juggling several different projects and strengthen the efforts in letting Chinese people know the truth about Falun Gong. The conference helped practitioners to find out their cultivation shortcomings and to be clearer about the significance and urgency of being diligent in their cultivation. A practitioner who started practising Falun Gong in 2005 said in his sharing that in order not to affect his full-time job, he has been doing the five sets of Falun Gong exercises everyday and reducing his sleeping time so that he has time to tell people about Falun Gong. Aside from talking to friends and relatives, he has also telephoned the police, public security officers and the “610” offices in China, whose crimes have been exposed on the Minghui internet site, to clarify the facts of Falun Gong. A practitioner who helped to sell tickets for the 2005 NTDTV Gala in New York has been distributing information and selling tickets for a few weeks. When her heart was not pure, there were immediately people coming to tell her not to distribute information. She would realise that she should study the principles of Falun Dafa more. Her husband is not a Falun Gong practitioner. It was very interesting that whenever she went out to tell people the truth of Falun Gong and did well, her husband’s business became especially good. When she did poorly, then the business also was affected. A practitioner who learned Falun Gong through the Internet in China in 2003 said that he first heard of Falun Gong from the Chinese government propaganda in 1999. Faced with endless defamatory propaganda against Falun Gong in all the Chinese media at that time, he became very curious and was very keen to learn what exactly Falun Gong is about. He occasionally received Falun Gong information from Falun Gong practitioners. Because the information was not complete, he was not able to have a clear picture of Falun Gong. In 2003, he and his friends installed a broadband Internet connection, he received Dongtaiwang (a non-fixed Internet address) IP address and was able to down load relevant software that helped him to have a window to the free world. After reading much information on Falun Gong and practitioners’ cultivation stories, he made his mind up and downloaded Master Li’s teachings. When he listened to the first lecture of “Zhuan Falun” (the main teaching of Falun Gong), he couldn’t help shedding tears and became determined to practise Falun Gong. After coming to Germany, he has joined with local practitioners to do exercises together. He realised that aside from Master’s great benevolence, the fact that he was able to learn Falun Gong and become a practitioner in the terrible environment in China was closely linked to the efforts to expose the truth by practitioners in China and abroad through various means. The sharing by this practitioner who obtained the Fa in China moved may German practitioners - during the sharing their eyes were filled with tears. The information he got at that time in China was very incomplete, sometimes through a small torn piece of paper in the sports field after sport lessons. If practitioners could make use of the Internet to tell people in China the truth of Falun Gong, even a minute of time would bring hope to the Chinese people. Some practitioners mentioned that they had new understanding towards the practitioner who had been helping to sell NTDTV Gala tickets in Berlin. Before they complained about too many emails from her and her not very fluent German. They formed a mentality to keep distance from her in their hearts. After listening to her sharing in the conference with a calm heart, they found that they had biased opinion about her. This conference was very special that western practitioners attending the conference far outnumbered the Chinese. Before the conference, many western practitioners didn’t quite comprehend the urgency of telling the truth to Chinese people. Some didn’t realise the importance of using Internet tools to expose the persecution. Through this conference, many practitioners were able to find out where they fall short compared with fellow practitioners. Practitioners were determined to strengthen their efforts in telling the truth to Chinese people.